I was given about 200 mason jars and I have been trying to come up with a way to use them. I have thought about making small lamps with some of them but I also wanted to use them to organize "stuff" in my household. I already use plain jars to store thread, bobbins and other sewing notions in but they look messy on my sewing shelves. I decided to add some fabric to the jar and add a row with sewn in pockets so that I could store my seam ripper and other sewing gadgets. Plus the fabric hides whatever is being stored inside. This goes a bit beyond all the pincushion mason jars I have seen on pinterest. Sometimes you just gotta hide stuff! This was my grandmother's sewing basket...I keep it on my sewing table. I am still tweaking this little creation and I have ideas for other similar uses. This can easily be designed around any theme and would make a nice gift. I think it looks cute on my sewing shelves, nestled among my stacked set of blue band boxes I use to store fabric. I would have been happy to show you but just as I was taking that particular photo, my camera informed me that it's battery was exhausted. Anyways, this is what I was working on last night. I will continue to adjust it until I am completely happy with it. 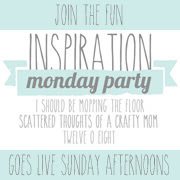 Family Home and Life's Wow Us Wednesday, Click HERE for the link and hop on over to the party! There's something for everyone!